The Witch's Island: Happy Birthday To Me! Well, it was my birthday this week just past, so now the Witch is now a year older. Actually it was my little brother’s birthday as well. We were born on the same date but five years apart. Maybe my parents planned it that way to save on the cost of cake and ice cream. Who knows, but it is kind of neat. I always know that there is at least one person in the world who will never forget my birthday! I had a great day. Lots of presents and good food. Hubby made me a cake from scratch. 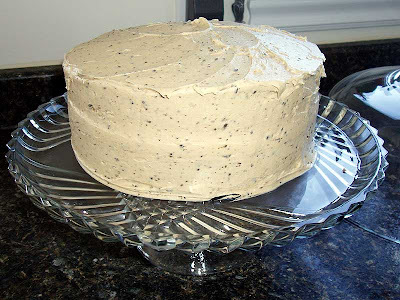 I was reading The Pioneer Woman’s site last year and I came across a really intriguing recipe for Coffee Cake. I printed it out and the recipe has been stuck to the front of our fridge ever since. Hubby overheard me mention to the girls on Games Night that I would like to have it for my birthday cake and what do you know? He actually baked it for me. It is the first cake he has ever made from scratch (won’t be his last now I know he can) and it turned out great. It is delicious and worth every sinful bite. It looked good, too. I think he did a great job on the icing. He’s going have to work on his self-confidence, though. On his way home from work that day he bought a Black Forest cake just in case the Coffee Cake failed. Two birthday cakes, what’s a girl going to do? And there were presents afterwards. I received gifts galore. I got books (including Gail Vaz-Oxlade’s latest), a magazine subscription (Our Canada), gift certificates to the Village, some chocolates and some cash from the folks back home. There is even one more to open tonight (almost like Granny New Year). Hubby tucked it away after we got back from the far-away city last weekend and only remembered it today. The Witch was spoiled and loved it. One of the books is a children’s story and it is really well done. I happened to notice a copy of “The Country Bunny And The Little Gold Shoes” in the library and it really fascinated me. It was written in 1939 and has a very strong female lead. The mother bunny is a single parent who perseveres in a male dominated world while still raising her family to be independent and hard working. I guess there is no “glass ceiling” for Easter Bunnies. Even if you don’t read too much into it, it is still a great children’s story. That’s it for now but don’t forget that “Earth Hour” happens tonight at 8:30 PM locally. Hopefully, it’s not that time right now while you’re reading! You know, The Witch, I have really enjoyed your blog over the last year but you've forced me to stop reading it. That cake picture makes me want to break my healthy eating plan !!! I'm drooling. 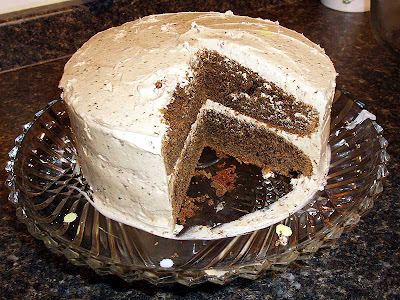 Cake, Coffee, Frosting. Yum. Sounds like you had a great birthday! Two cakes, I would have been in heaven! Enjoy the books! Happy belated Birthday! The cakes look good. ( My mom ended up with 2 birthday cakes this week too!) 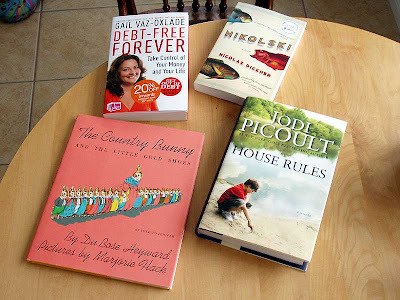 I had to laugh when I looked at the books, as I bought jodi Picoult's new book today, plus I loved reading the bunny with the golden slippers many years ago. It sounds like a wonderful birthday!! Your cake looks delicious too! Kudos to your husband for making one, and how thoughtful he was to want to make sure you had a cake to enjoy by getting a second one! He does sound like a keeper!!! Hi Witch! Belated Happy Birthday! I've been off-line for a while...sorry I missed the day...but I see you had a great day! Beautiful cake....!!!! Belated happy birthday greetings from this corner, too, and what a great celebration! 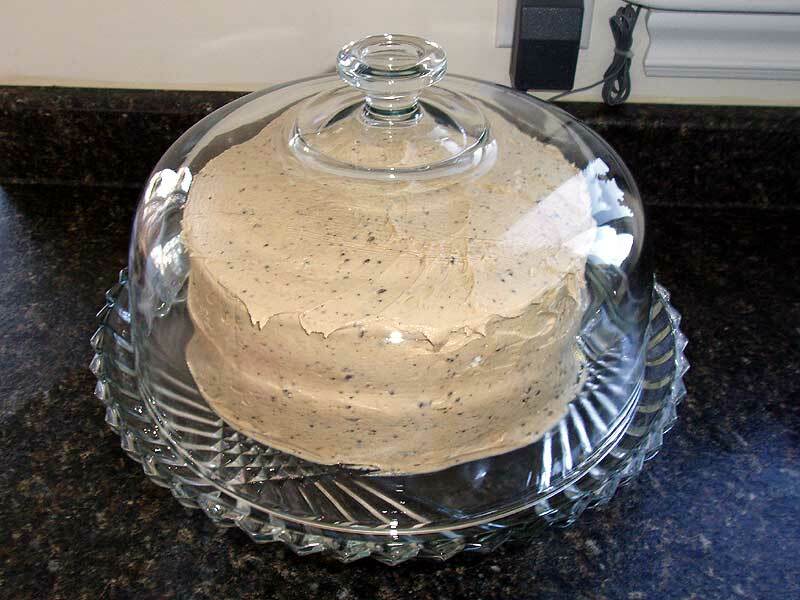 Hubby made a wonderful looking cake, so bravo! 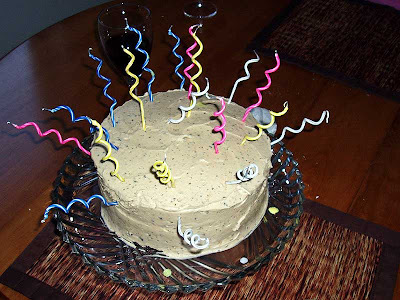 I love the squiggly candles, too, they make the cake look so festive. I think i shall ask for squiggly candles on my cake this year! I think i read the bunny story years ago, but i'd have to look through it again to be sure. I love celebrating birthdays and take great delight in hearing or reading when others enjoy their celebrations, too! Thanks to all who wished me a happy birthday. It was all that and more. The cake was delicious and we just finished the last piece with supper tonight so I guess I'll have to put my dome away again (for a while, anyway). By the way, Sister Megan, squiggly candles can be bought for a buck at Dollarama for a package that approximates one for every year for an old(er) girl like me.